The word cataract means to “break down.” The breakdown of the eye occurs when the normal arrangement of the lens fibers or the capsule is disturbed. A normal lens is 66% water and 33% protein. When this becomes unbalanced, the lens becomes damaged and more water moves into the lens. This equals a loss of transparency, which leads to a white appearance of the pupil that is indicative of a loss of vision. The whiteness of the eye is not to be confused with a condition known as nuclear sclerosis. This is a normal change in older animals. It can have a more gray appearance and is not painful. The types of cataracts are largely based on the age of the pet. Congenital cataracts are cataracts that the pet has when it is born. Breeds predisposed to this are Cocker Spaniels, Boston Terriers, Miniature Schnauzers, and Westies. Early-onset cataracts affect the younger animals. Causes may include heredity, trauma, infections, toxins, and diabetes. Senile cataracts occur in dogs over 6 years of age. Other causes of cataracts can include hypertension and UV light. Diabetes poses one of the worst threats to cause cataracts. As the blood sugar goes up in the body, so does the blood sugar in the eye. The extra sugar is then transformed into sorbital within the lens. Sorbital draws water into the lens, causing cataracts in both eyes. Interestingly, cats do not form cataracts from this as they have other ways to process the increased sugar. 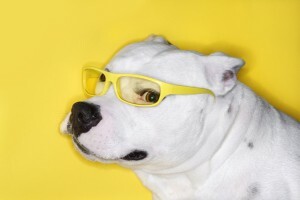 Cataracts cause pets to go blind. If this is the only thing that happens, animals usually cope very well. Sometimes the cataract can luxate, start floating around the eye, and cause damage. The lens can also swell and cause glaucoma, which is very painful. The treatment for cataracts is surgery. Removal of the lens and replacement with a prosthetic is recommended. Candidates that are not considered for the surgery are uncontrolled diabetics, animals in poor health, and aggressive animals. The ophthalmologist will check the retina to make sure it is functioning properly before surgery, and the recovery process is long. You will have to medicate the eye and make return visits to the ophthalmologist. Without the placement of a prosthetic lens, the dog’s vision will be about 20/800, and everything will be reversed, which is okay as the dog does not see the world as we do. Dogs have a focusing power about 3 times less than a human and a cat only has about 50% of the focusing power.